As I mentioned in a previous post, my Huxley's extruder was failing pretty consistently, allowing the filament to to twist off the hobbed bolt midway through prints. Net result here was that unless I happened to notice pretty much immediately, the plastic would stop flowing and ruin the print. 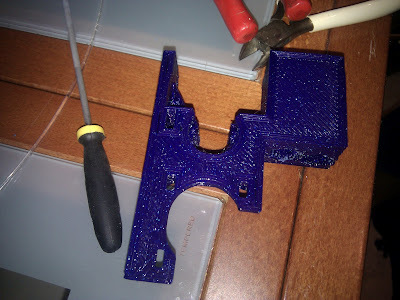 I knew that I needed to find a way to support the filament more fully and was thinking about designing an insert. As I'd heard of other Huxley users with similar issues I checked out Thingiverse first, and came across Weldingrod1's object. This replacement Huxley extruder uses all the original parts from the eMaker derivative, provides extended filament guidance and also has an additional block intended for holding marker pens, so that the user can experiment with colour mixing on the fly. Perfect! The replacement extruder looks great in Galaxy blue PLA, the photos really don't do this lovely material justice. My calibration efforts are really starting to pay off now too, and the object required very little tidying up straight off the printer. 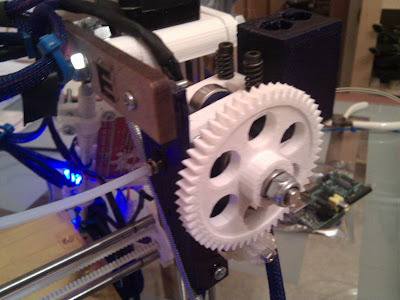 My extruder, once assembled is a bit of a franken-struder now, with the original large gear and a new idler cover in white PLA, the extruder body in Galaxy blue and the small gear transparent! Looks aside, it all fitted well together and works a treat - I've now done several prints with this assembly and the filament is rock solid in its guidance, not slipping once since the installation. I haven't tried the marker holders as yet, but will give that a go at some point. I'll put a few more pictures in the gallery for those interested. Thanks Weldingrod1 for a very well designed derivative part!